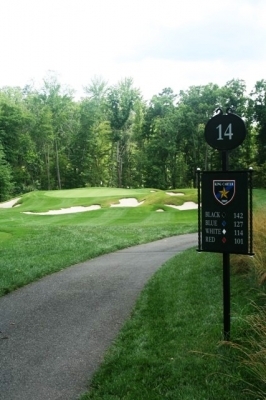 IRVINGTON, VA – “We need more King Carter’s to help grow the game,” remarked Joel Weiman, Senior designer for McDonald & Sons, Inc. (of Jessup, MD) – and lead designer of King Carter Golf Club, which resides in Virginia’s Northern Neck area. Taken alone, Weiman’s statement may have been referring to the famous Robert ‘King’ Carter of Lancaster County, Virginia, one of the wealthiest and most powerful men of the Colonial era (and the club’s namesake, of course). Though it isn’t likely we’ll ever see a figure with the power and influence of ‘King’ Carter in our parts again, we hope, someday, to have more golf facilities like King Carter Golf Club in our future. 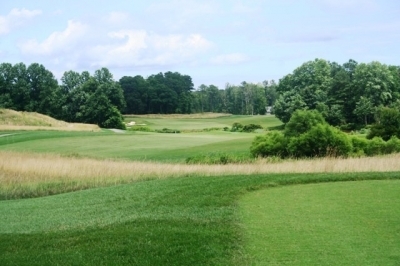 King Carter has made quite a splash on the Mid-Atlantic golf scene in its few short years of existence, partly due to its designation by Golf Digest as ‘the best new Affordable Public Course’ of 2006. Considering the number of courses that open nationwide every year (at least back in the middle part of the decade), that’s quite an honor – and has gone a long way towards solidifying King Carter’s reputation as a place where you get a lot of golf course bang for your buck. The par three 3rd hole is the first where water comes into play - just one of the diverse looks that King Carter Golf Club offers. Indeed. The Hills Quarter was one of the original five quarters of land given to ‘King’ Carter’s father, John, by Lord Fairfax of England in the mid 1600’s. It’s not known today why it was called ‘Hills Quarter,’ though county records from the latter part of the 17th century refer to this parcel of farmland by that name – possibly because of its hilly nature set amongst basically flat countryside. The 305-yard, par four 16th hole is risk-reward all the way, with two fairways to choose from off the tee. “The process took ten years to accomplish, but it was definitely worth it,” Wilson added. And while Donofrio didn’t actually design the course, he was instrumental in its construction. As noted above, Joel Weiman designed the golf course, with Andrew Green acting as the field architect. Storm clouds gather over the green of the par four 5th hole - and this bunker awaits any shot struck slightly off the mark. Of course the old saying goes that good things come to those who wait – and in King Carter’s case, it appears to be true. 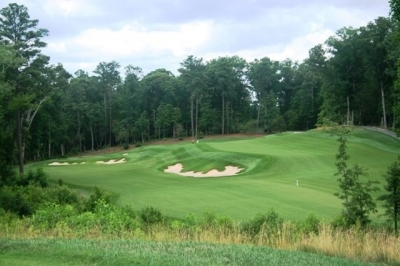 King Carter is unique for more than its reasonable price – there are lots of golf courses that you can play for around fifty bucks. But after completing the loop at King Carter, you’ll get a sense of having seen something pretty remarkable for your coinage. Looking from the tee of the par five 11th hole, which has deservedly earned King Carter's #1 handicap designation. King Carter's current clubhouse fits in nicely with the historic theme of the property. Photo courtesy of King Carter Golf Club. 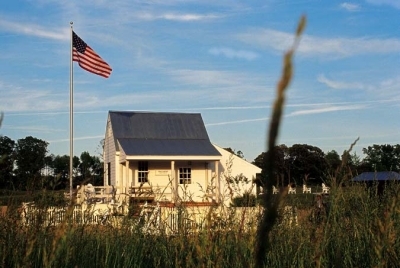 Weiman’s right – and for those visiting King Carter for the first time, you might be surprised to see their ‘clubhouse’ is a pretty simple historic structure with very little merchandise and functions merely as a place to direct golfers to where they need to be – what else could you ask for? At 142-yards, the par three 14th hole is the shortest at King Carter - but trouble lurks all around the green if you miss the putting surface. Turning the corner on the par five 9th hole - you'll need to avoid the trees on the left side of the photo with your second shot in order to have a clear view of the green. Though houses are visible on many parts of the golf course, they’re certainly not intrusive – and rarely would come into play for anything other than a very badly missed shot. The playing areas can be described in one word: wide. 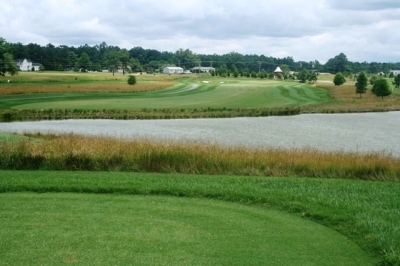 This is one community golf course where the homes and the golf blend in nicely together. If only every golf community was planned this way. Though there’s some variation throughout the outward and inward nines, the front and back sides can basically be divided in character between the relatively flat and open front nine, and the more tree lined and topsy-turvy back nine. 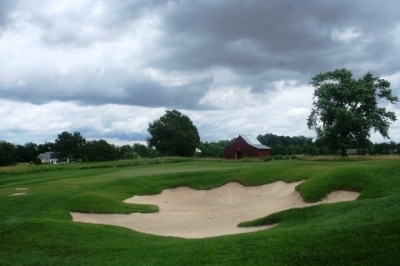 King Carter’s bunkering (as Weiman alluded to) is certainly distinctive, with the edges well defined and visible – an artistic touch that the course can call its own. From behind the green of the par four 13th hole, you can see how the golf hole fits nicely with the land. “The defining features at King Carter are the bunkers, inspired by free form shapes popularized by Alister Mackenzie. Not only are the bunkers large with jagged edges, they are scattered in random fashion, used aesthetically as much as strategically,” Wilson added. This mild forced carry is the least of your concerns on the long and difficult par four 4th hole. King Carter’s rough was as ‘punishing’ as Wilson advertised. If you’re in it, don’t plan on advancing the ball very far in some circumstances – almost as penal as a hazard. Geometric mowing patterns are present throughout the course at King Carter, but show up particularly well here at the par three 17th hole. 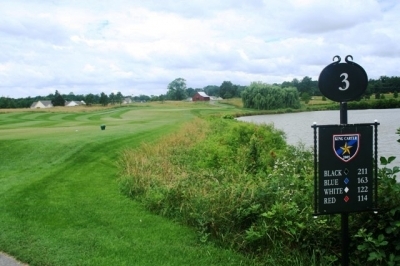 King Carter’s highlight holes include the bruising par four fourth hole, a 430-yarder that plays over a pond and into the teeth of the prevailing wind. Like most holes at King Carter, there appears to be a very wide landing area -- but it narrows for longer hitters. 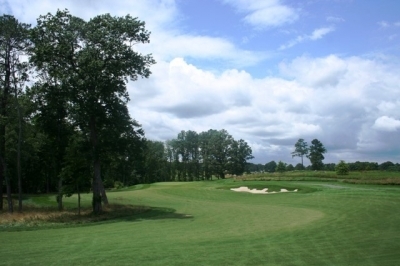 The difficulty doesn’t end with the drive – the approach shot plays uphill to a well bunkered green. The 515-yard par five ninth hole is certainly one you’ll remember. Pay attention to your yardage book, as you’ll definitely need to aim for the right spot on the somewhat blind second shot. There’s a stand of trees that longer hitters may try to go over to reach the green in two – for the rest of us, we’ll need to aim comfortably to the right of the trees, which will leave about a wedge shot into the green for the third shot. Turning to the back, the 305-yard sixteenth is an attractive risk-reward hole. “It’s a great hole because there’s a split fairway that allows players to go left with a mid to long iron off the tee which leaves you a delicate wedge shot into a small green – or you can try going to the right with a driver to try to power it on to this reachable hole,” Wilson mused. 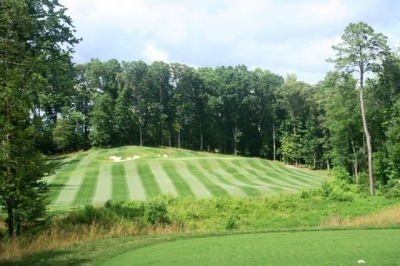 The par three 17th hole showcases King Carter’s geometric mowing patterns – add the fact that it’s uphill, and it plays much longer than the scorecard’s 194-yards would indicate. 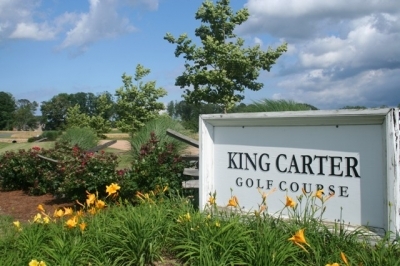 Missing from the description of King Carter to this point is some notation on the service – and while most every golf club strives to provide a friendly and helpful service element, King Carter’s was especially noticeable. Perhaps it’s that old Virginia charm at work. That’s quite a family to be welcomed into – from a historic perspective as well as today’s golfing world. King Carter is definitely worthy of the many good things written about it, and is a more than welcome addition to Virginia’s golfing family as well. Rates include greens fees, cart fees, and range balls. Walking is allowed at any time. During the regular season King Carter offers a twilight rate beginning at 3:00. Rates during twilight are M-T $30, and F-S $35. 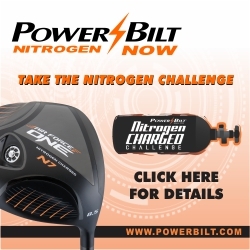 The twilight rate does not include range balls. 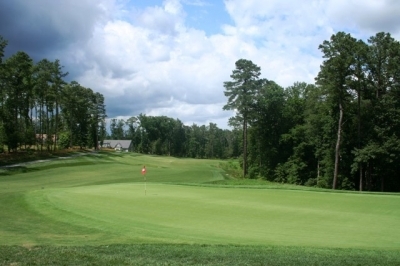 Group rates start at 20 golfers and can be customized to include lunch and/or prizes.